Barbados is a friendly little island with a great dive community. 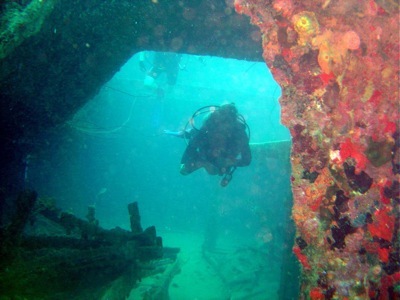 The dive centres based on the West Coast are blessed with easy proximity to a selection of wrecks, including the jewel in Barbados’s wreck-diving crown and some argue the most impressive wreck in the Caribbean. The Stavronikita (or ‘Stav’ as she is affectionately known locally) was sunk by the Barbados government in 1978. Due to having been sunk deliberately the Stav has been prepared for penetration and positioned well. She is 110m long and sits upright on the 40m deep seabed facing shore. The top of her mast is only 10m beneath the surface. Points of interest include an enormous propellor, an interior tour from the starboard side near the propellor, of cabins, corridors and compartments on the way to the cargo hold as well as the large deck area before the bow. The whole wreck is encrusted with corals and sponges and also features a healthy population of territorial sargeant majors who will nip the fins of passing divers if they sense the diver is too close to their eggs, which they lay on the many flat surfaces of the wreck. Sadly the bridge is no longer accessible as it is too fragile following hurricane damage. There is a small sign on a chain hanging across the previous access point to warn divers. Due to the depth of the Stav, the penetration element and the site’s susceptibility to the effects of currents the Stav can be quite a challenging dive. It is amazingly atmospheric though as you descend down the height of mast and full sight of the wreck appears before you. The Pamir is a photographer’s dream. She is a 65m freighter and was sunk in 1985. The hull lies in 15m depth and the bow in 12m. It is possible to descend into the cargo hold and swim through to the front portion of the boat. The combination of several years beneath the sea and lying at a shallow depth has resulted in the wreck being covered in colourful sponges and corals. There is a lot of fish life too including soldierfish, grunts, gurnards and sargeant majors. One of my favourite critters lives here too. If you look very closely you can see tiny little holes in the coral growth over the surfaces of the wreck and inside those tunnel-like holes live gobies. These shy little creatures play a fun game of hide and seek with divers and frustrate photographers. The Pamir lies on a sand patch in the reef. Sand eels can be seen in the sand around the wreck and I have seen squid and large crabs in the surrounding reef, so by all means dive the wreck, but don’t turn your back on the nearby reef. Off the south coast, Fry’s Craig is a 70m freighter in15m depth. She sank in 1985 in a sand area inbetween two reefs. She is badly damaged in the middle and quite broken up. The spot inbetween the two reefs means there is a steady stream of reef traffic including squirrelfish, sargeant majors, blue tang, grunt, yellow goatfish, rays and octopus. There is apparently a resident hawksbill turtle, she must have been out when I called.